Theories about hominin evolution are often connected intimately with notions of what it is to be human. Such ideas have had a particularly strong infl uence on thinking about the defi nition and origin of the human genus (see Landau, 1993; Wood and Collard, 1999; Wood, 2009). 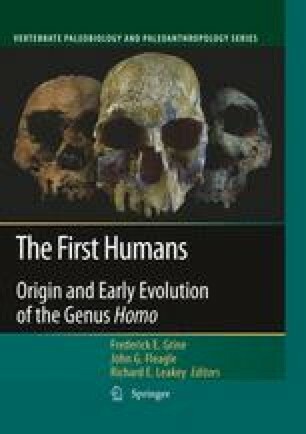 Many, if not most scenarios for the evolution of the genus Homo emphasize the importance of quintessentially human traits such as large brains, tool-making, and complex cognition. Usually these derived features have been interpreted, explicitly or implicitly, as a suite of novel strategies that emphasize cognitive over athletic means of competing with the rest of nature (“red in tooth and claw”). Most animals compete with each other to a signifi cant extent using athletic capabilities such as strength, power, agility and speed. Obviously, humans compare poorly with other mammals, including African apes, in these characteristics: we are weak, slow, and awkward creatures. Even though male chimpanzees weigh less than a typical adult modern human, they can produce much more force, can sprint more rapidly, and are obviously more agile during locomotion (Stedman et al., 2004). Yet, although no human alive could match a chimpanzee in hand-to-hand combat, our cognitive capacities are extraordinarily better developed. Accordingly, it seems reasonable to focus on evolutionary scenarios for the genus Homo that explain the triumph of brains over brawn. Interestingly, the idea that humans are poor athletes is demonstrably wrong in one crucial respect. While humans have comparatively poor performance capabilities in terms of power and strength, we are unusually specialized endurance athletes, with surprisingly impressive aerobic performance capabilities. These capabilities are particularly remarkable for endurance running (ER), defi ned as running long-distances (>5 km) using aerobic metabolism. These capabilities, which have been reviewed in depth by Carrier (1984) and Bramble and Lieberman (2004), compare extremely well to other mammals, especially primates, in terms of several performance criteria such as speed and distance, especially in hot conditions.